By Sean Barron | April 29, 2018 at 7:34p.m. When asked why she feels having HomeGoods build a distribution center in her community would be a hugely positive development, Tracie Luzadder neither hesitated to reply nor minced words. “Jobs,” said Luzadder, who’s worked eight years as an industrial cleaner for the General Motors Lordstown Assembly Complex. 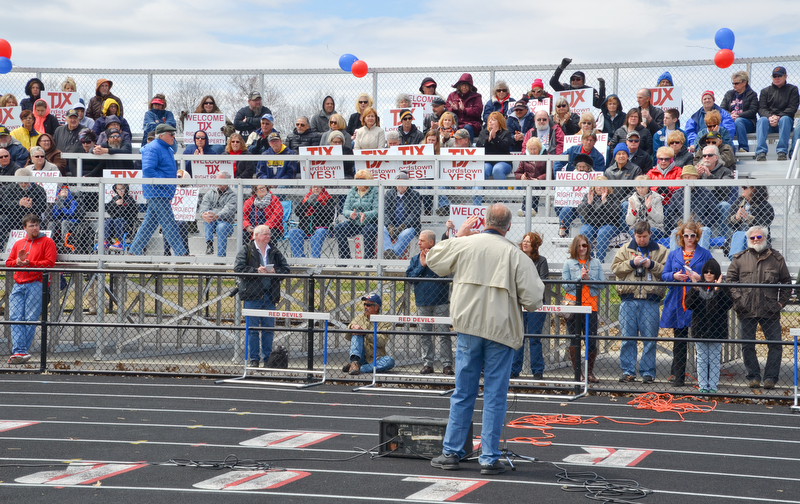 She also was among the estimated 620 residents, elected officials, labor leaders and others who came to an outdoor rally Sunday afternoon at the Lordstown track/soccer complex to persuade the company to invest $160 million toward building the 1.2-million-square-foot distribution facility in the village. HomeGoods, a division of TJX, recently rescinded its zoning application after some nearby residents protested using the property for the distribution center. TJX owns Marshall’s, T.J. Maxx and other retail outlets. She added that the HomeGoods center also will offer good jobs to young college graduates. Mayor Arno Hill noted that the company is “jumping through a lot of hoops” to set up shop in the region, and that the warehouse could create between 1,200 and 1,400 management, distribution and other jobs at a time when the Mahoning Valley needs to focus more on diversifying its industries. The project also will have a positive effect on home values and be a financial boon to the school district, explained Hill, who dispelled what he said were myths surrounding the distribution facility. Those include rumors that all of the jobs will pay low wages and be part time, he continued, adding that the company has not made the wage scales public. Hill also addressed what he said were concerns of those who oppose the move, including potential heavy traffic and storm-water runoff. People who live near GM adjusted to an inevitable increase in traffic when the assembly plant had 12,000 workers; in addition, TJX is willing to work with neighbors and has to work out other details beforehand, he noted. William Catlin, Lordstown Board of Education president, said the project could bring about $250,000 a year to the school district when many have been losing tangible personal property tax revenue from the state. In addition, warehouse jobs likely will benefit the schools and mean added amenities for the village, such as a full-service grocery store, because more families will move to the area, he continued. “We can’t afford to let this go,” said Harvey Lutz, a grain farmer who owns one of the seven parcels near Interstate 80 and Bailey Road on which the center could be built. Lutz, who operates Lutz Farms near Warren, recently pitched a plan to convert his property into a chicken farm if HomeGoods opts not to build there. “What’s good for Lords-town is good for the entire Mahoning Valley. The Valley is strong when we play together,” said state Sen. Joe Schiavoni of Boardman, D-33rd. Whether HomeGoods decides to locate near East Liverpool, Lordstown or elsewhere in the region, the area’s economy will receive a huge boost, he added. Most people have little control over today’s economy, which is far more global and automated than it was 30 years ago. Nevertheless, they can be influential in making the case for the company to come here, said U.S. Rep. Tim Ryan of Howland, D-13th. He added that HomeGoods looked all over the U.S. for potential sites before considering Lordstown. “Our community is behind this project. Our whole Valley is open for business, and we’re going to stand behind [TJX],” said state Sen. Sean O’Brien of Bazetta, D-32nd. O’Brien noted that his office has been working at the local, state and federal levels, along with the Youngstown/Warren Regional Chamber and other entities, and looking at what can be done to expedite making the necessary zoning changes from residential to industrial. State Rep. Glenn W. Holmes of McDonald, D-63rd, said that such a project is essential in diversifying the region’s labor pool that includes the skilled-trade industries, electrical workers, carpenters, roofers and engineers. “It will be an overwhelmingly positive domino effect on our community,” Holmes added. Echoing those views were Trumbull County Commissioner Dan Polivka and Carlton K. Ingram, executive board member with the International Union of Operating Engineers Local 66. Helping to spearhead Sunday’s rally was Actionable Insights, a Sharon, Pa.-based analytic, data-driven marketing firm. Jason Wood, chief executive officer, wanted to start a digital-marketing campaign to bring TJX to the area, noted Marci Radcliffe, Actionable Insights’ director of business development. March 30, 2019 10:14 p.m.